My husband showed up before the boy, even, but not early enough to make coffee on the wood stove for him. We found that it takes about 50 minutes from starting the fire until the coffee is ready. Tough. I finished the second part of the crochet blanket in time for today’s third part. We talked about my husband’s blog and his recordings from August and art for a bit. He needs to find out what direction he wants to take this in. You could also call that a project meeting. Then I went grocery shopping. 39 minutes of exercise walking – at least that’s what my fitness tracker tells me. I came home, unpacked and took over lunch prep because my husband was expecting a friend who had asked him to repair a broken amp. 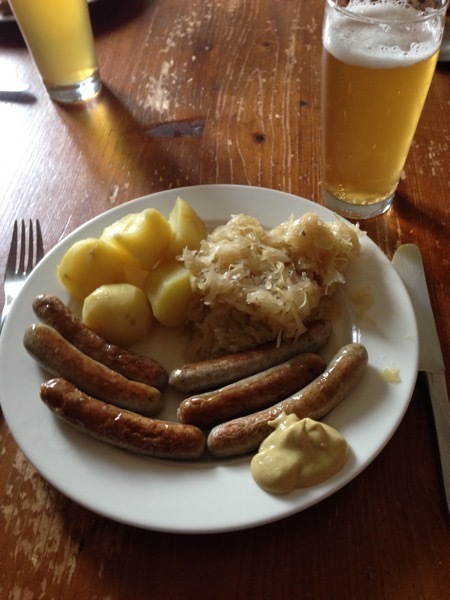 So yesterday I actually cooked potatoes and fried bratwurst. On the wood stove. It’s nice to know that I am still able to cook if I have to. Meanwhile I was worrying about the pictures I had taken for the knitting magazine and after talking to my husband I decided to take new ones. So after lunch I put on makeup and a different sweater ASAP and took some new pictures. (Hint: they weren’t much better than the old ones. Note to self: remember that taking pictures takes time and diligence and good light). Then I recorded the podcast. I was finished early despite it being a rather long episode because I had started so early. My husband had given me a spot light to use but it turned out to be not really helpful. After some discussion I have now ordered something new. I hope that will work. Afterwards my computer didn’t want to save the video. He said the hard drive didn’t have enough space left. Cue frantic deleting. Phew. Then I taught my first student of the day. In the following break I started working on the podcast, then the boy forgot all about his piano lesson – so more work on the podcast and then two more students. Then we skipped strength training because my husband had made fried potatoes and eggs for dinner (and nobody wants to train after having eaten), I worked some more on the podcast, planned to stare at the novel blankly for a few moments but then had to confer with the boy about which subjects he should take next year, why geometry is silly and other important things. Went to bed almost on time. Today there will be the getting the podcast ready for publishing (I hope), the train ride to refill my thyroid medication, the shopping at the nicer health food store, the cleaning of the house, pizza for lunch and then non-stop teaching all afternoon. We have decided to stay home tonight which is very, very good. There might be strength training then, and Star Trek and crochet.